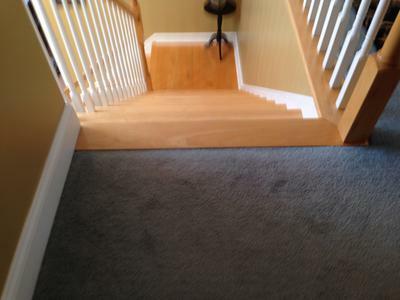 Q- The landing/hallway at the top of my stairs is carpeted - there is a smooth transition from the carpet to the "finish" tread at the top of the stairs. My laminate flooring is thinner than the hardwood of that top tread - how would you recommend making that transition from the thinner laminate to the thicker tread to minimize any tripping hazard ? Also, how would you finish the transition where the laminate butts up to the stairs along the hallway ?- many thanks. 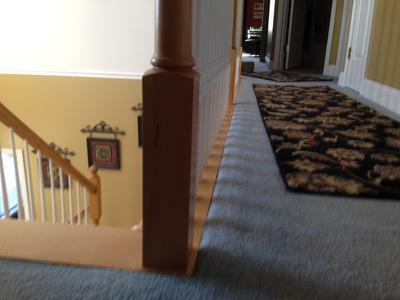 A- Based on your photos it looks like there is a slight edge of the top stair higher than the carpet due to the carpet being walked on. This is normal as carpet does flatten out over time. This looks like it could be a tripping hazard but people get used to things and learn where to step and not to step. I have a 1 1/2 inch step up in my home, and over time we just got used to it and don't trip on it. If it were my home I would have looked for a laminate that is 12mm or 14mm so it could be level with the top stair, if it were I would use a T-mold there. I'm assuming the top stair is 3/4 of an inch thick. would be with the top stair. It may minimize the height difference. Another thing to do that might help minimize a tripping hazard would be to run the laminate the long way in your hallway so the planks will be perpendicular to the top stair. This will draw attention to the top stair. Join in and write your own page! It's easy to do. How? Simply click here to return to Add a FAQ about anything that has to do with laminate flooring.